Our Best Bets improved to 8-2 in their last 10 as the Blues and Lightning went Over 5 last night, but we went 4-6 overall including our leans. Another massive performance by the Blue Jackets last night, whipping the Penguins 7-1. It seems a lot of people have been hesitant to believe Columbus is for real, but they’ve seemed legit to us for quite a while. Now, just when everyone lines up to bet on the Jackets, watch them lose to Montreal tonight in a revenge game for the Habs. The NHL serves up that and 11 other games for us tonight before shutting down for a Christmas break. There’s potential for plenty of distractions for players at this time of year, and you might want to tread lightly with your NHL betting because of that. We have found this to be a pretty unpredictable week. Just a standard breakdown on the Best Bet today as opposed to our usual writeup as we ran out of time – the kids need to see Santa right?. We wish all of you guys and girls a Merry Christmas and hope you get to enjoy lots of quality time with your families over the next few days. We’ll be back on December 27th to break down the 10-game card! Reasons to bet Colorado: As bad as the Avalanche has been this year, they’re 7-9 on the road. Colorado has won 5 of its last 7 visits to Chicago. Reasons to bet Chicago: The Blackhawks are 13-3-3 at home and coming off a 4-3 loss to Ottawa Tuesday that snapped their 5-game winning streak. Colorado was humbled 6-0 at home last night and has given up 30 goals in its last 7 games. Reasons to bet Buffalo: The Sabres have earned at least a point in 10 of their 15 road games (5-5-5). Buffalo has won 5 of its last 7 visits to the Islanders. Reasons to bet New York: The Islanders snapped a 5-game losing streak Tuesday with a 4-2 victory in Boston. Buffalo has lost 3 in a row and is playing for the second straight night. Reasons to bet Minnesota: The Wild has won 9 straight games and outscored its opposition 23-7 in its last 6. New York was drubbed 7-2 Tuesday in Pittsburgh. Reasons to bet New York: The Rangers should be fresher after having 2 days off for the first time in more than 2 weeks. New York is 12-5-1 at home and Minnesota has 8 wins in 17 road games (8-5-4). Reasons to bet New Jersey: The Devils responded well last night to criticism from their GM, blanking the Flyers 4-0. Pittsburgh lost 7-1 in Columbus last night to fall to 1-1-2 in its last 4 games. Reasons to bet Pittsburgh: The Penguins are 14-2-2 at home, where they’ve won 6 of their last 7 versus the Devils. New Jersey’s lost 5 straight on the road and is 4-11-5 away from home this season. Reasons to bet Tampa: The Lightning overcame a 2-0 deficit to beat the Blues 5-2 last night and improve to 3-1-1 in its last 5. Washington has lost 2 straight, scoring 3 goals in those 2 contests. Reasons to bet Washington: The Capitals are 11-5 at home while Tampa has lost 7 of its last 8 road games. The Lightning is 1-7 in its last 8 games on 0 days rest. Reasons to bet Montreal: The Canadiens seek revenge for an embarrassing 10-0 loss Nov. 4 in Columbus. The Blue Jackets could let down after routing the defending Stanley Cup champion Penguins 7-1 last night. Reasons to bet Columbus: The Blue Jackets have won 11 straight games, allowing just 17 goals during that span. Montreal is just 6-5-2 on the road and has scored 2 goals or less in 4 of its last 5. Reasons to bet Detroit: The Red Wings are well rested, having played just 1 game since Saturday (their Monday game in Carolina was postponed). Florida has lost 7 of its last 10. Reasons to bet Florida: The Panthers have already beaten Detroit twice this season and have won 6 of the last 8 meetings. Detroit has lost 5 of its last 6. Reasons to bet Boston: The Bruins won 3-1 in Florida last night to improve to 10-5-3 on the road. Boston’s won 7 of its last 10 against the Hurricanes. Reasons to bet Carolina: The Hurricanes are 9-3-1 at home, where they haven’t lost in regulation time since Nov. 10. Boston is 1-7 in its last 8 games on 0 days rest. Reasons to bet Los Angeles: The Kings blanked the Predators 4-0 last night in Nashville and have now allowed 4 regulation time goals in their last 5 games. Dallas has lost 12 of its last 17 home games versus LA. Reasons to bet Dallas: The Stars have been off since Tuesday while the Kings are playing their 6th road game in 9 days. Dallas has allowed 2 regulation time goals or less in 7 of its last 9 games. Reasons to bet Vancouver: The Canucks have scored 18 goals in their last 5 games. Calgary has lost 3 of 4 following a 6-game winning streak and is just 7-9 at home this season. Reasons to bet Calgary: The Flames have won 6 of their last 7 home games versus the Canucks and 7 of the last 10 meetings overall. Vancouver is playing its 4th game in 6 days and at high altitude. 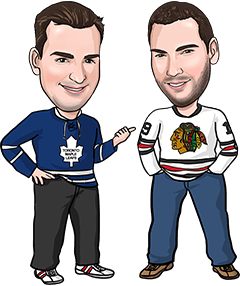 Reasons to bet Toronto: The Leafs have earned points in 5 of their last 7 games (3-2-2) and whipped the Avalanche 6-0 last night in Colorado. Arizona has lost 3 straight and 10 of its last 13. Reasons to bet Arizona: The Coyotes are 6-7-2 at home and have won 5 of their last 6 home games against Toronto. The Leafs have scored 2 goals or less in 8 of their last 10. Reasons to bet Edmonton: The Oilers have won 3 straight games and are 10-5-4 on the road. Edmonton has 2 wins and a shootout loss in its last 3 trips to San Jose. Reasons to bet San Jose: The Sharks have won 5 of their last 6 games and 12 of 15. San Jose has won 23 of its last 32 games versus the Oilers.